Janelle In Real Life: my two peas, a curling story, and stripes (duh). my two peas, a curling story, and stripes (duh). 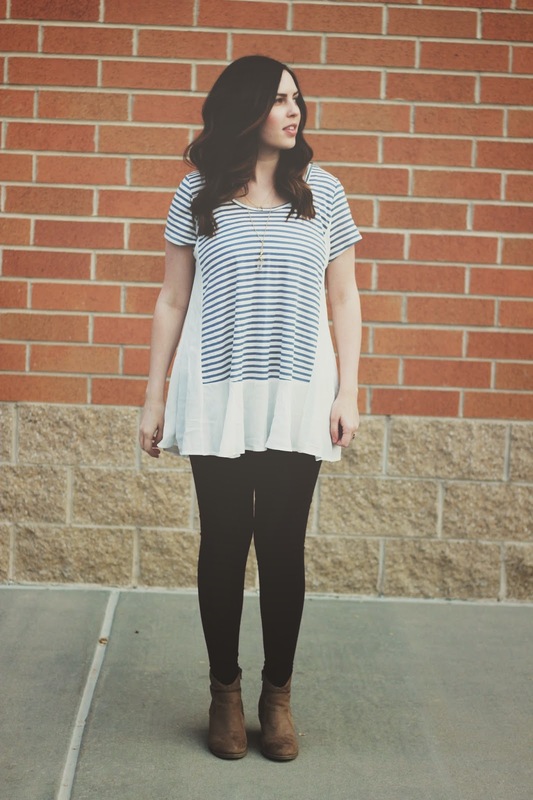 Tunic tops and leggings were my go-to during pregnancy, and look! Nothing's changed. It feels a little more lazy since I don't have the excuse of being pregnant, but who in the world even cares. Another thing that I should mention? 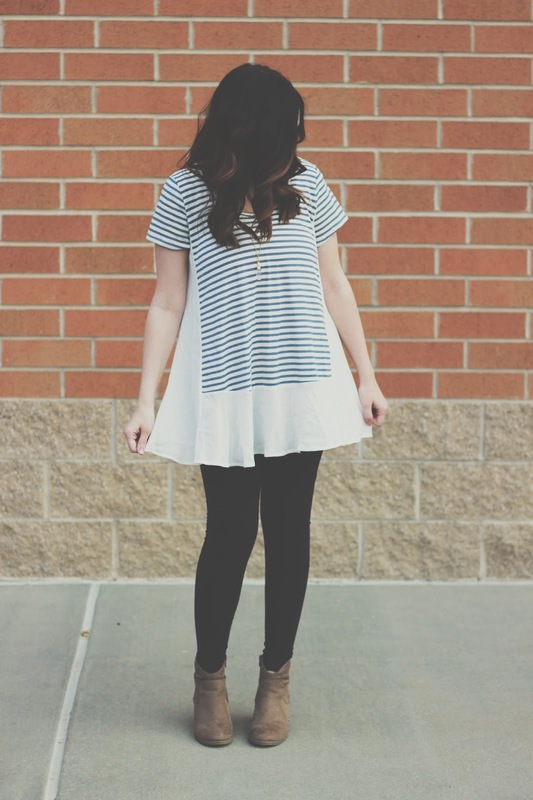 This is the third fashion post in a row in which I am wearing a striped top. Some of you are probably suuuuper bored of that, so sorry! I've been trying really hard to just document my outfits when I'm able to, and I apparently have been wearing lots and lots of striped things. 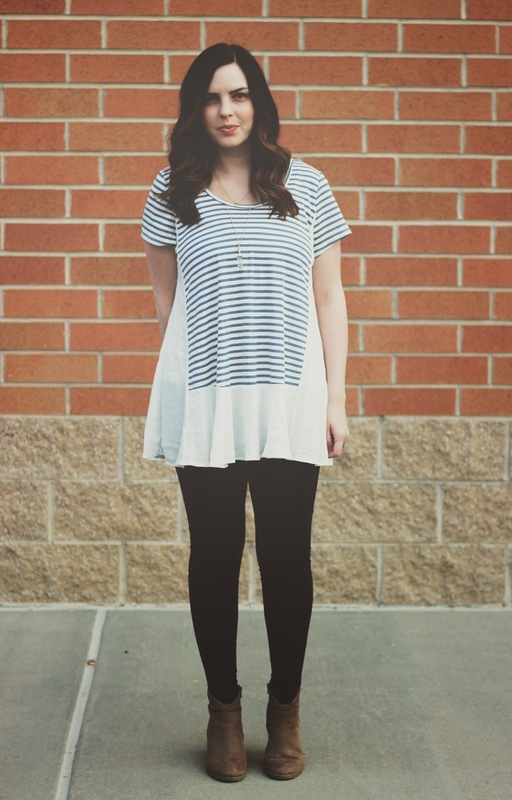 But really, who doesn't like a striped top?! And let's talk for a minute here about how I actually forgot how to curl my hair for a couple months. Is that the weirdest thing ever? I've had this way of curling my hair with a straightener that I've literally been doing for years. It's my favorite hairstyle. For some crazy reason, one day I forgot the trick to making it work with my hair (having my hair all different lengths for the last year didn't really help). For several months, every time I tried to curl my hair it just looked weird and not right. So frustrating, my friends! One week I was so determined to figure it out again and I curled my hair every day a different way so I could get my technique back (I know hair gurus around the world are cringing at the fact that I took a straightener to my hair every day which is a great way to fry your hair off) and I finally remembered how I used to do it! So now when you see me with my hair curled you can think of those painstaking months I endured of badly curled hair. Aaaaanyway, lets move past the hair rambling. I am settling in (finally) to being a mom of two, and it's a crazy, wonderful experience. I loooove seeing my boys together. Nathan always watches Carson when he's being crazy and gives him cute baby smiles. Carson gives Nate kisses and pets his belly saying "Heh-woh baby!" They are two little peas in a pod. The hardest part for me right now is that we've more or less settled into a schedule in which I have no time to myself. As soon as one kid goes down for a nap, the other wakes up! And when they're both awake, they both want all of my attention. But we're making it work! I'm thinking of posting a little "day in the life" for us incase any of you are interested in the day to day. I hope you're all having a fun and fabulous day! OOO love the top, I wish it was longer because it would make the cutest dress! 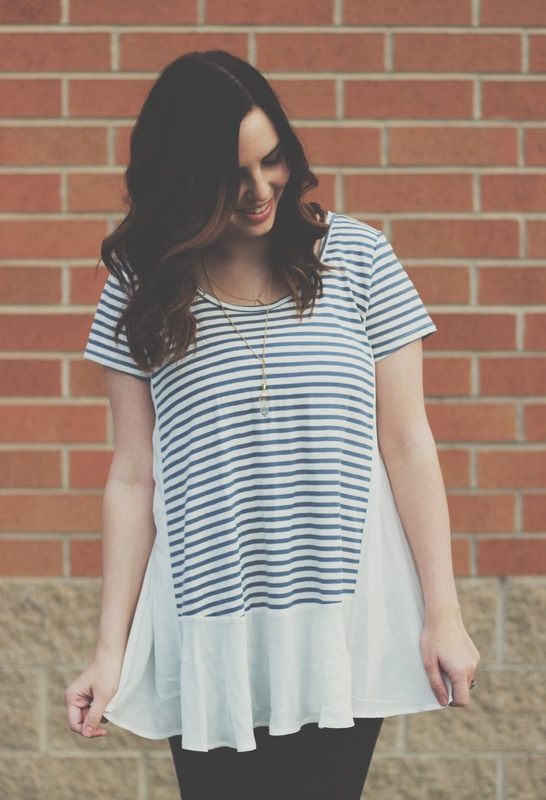 I have a stripe obsession too, so its not repetitive, I promise! Ah I've tried curling my hair with a straightener, but could never figure it out;glad you re-learned it! I adore that top, so flowy and fun!! And your hair is gorgeous. Glad I stumbled upon your sweet blog!! Love the flow and style of that shirt. You look stunning! 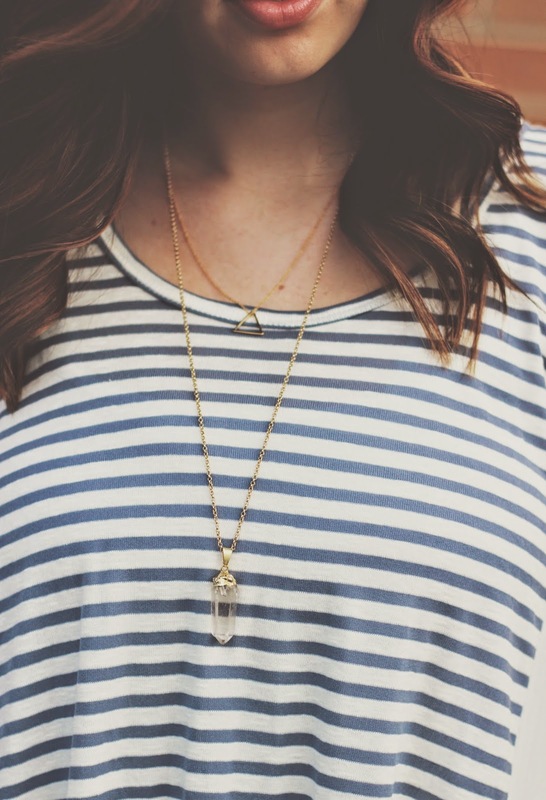 I love those layered necklaces. Such a pretty and classic look! Love this top! I am a total fan of stripes, so I don't think you can ever have too many. Look great! Thanks so much for stopping by my blog! You can never go wrong with an outfit with legging. 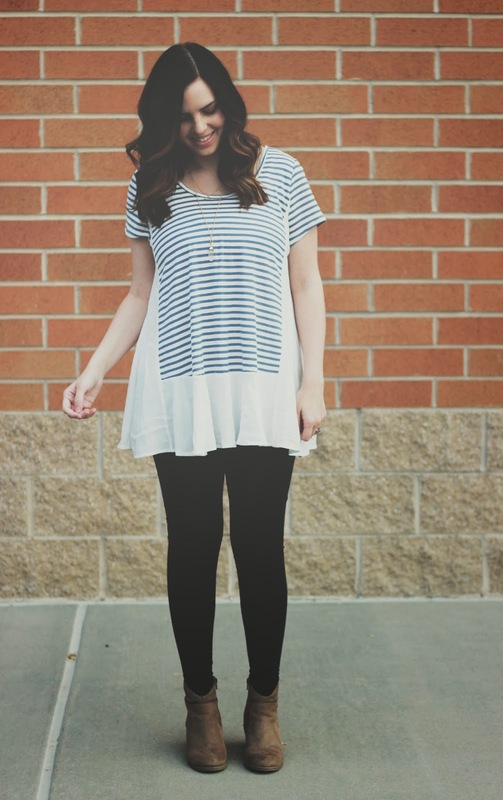 Great look, stripes are my favorite print for spring season and this tunic looks great, I really like it. You rock the stripes! that necklace is so cute! 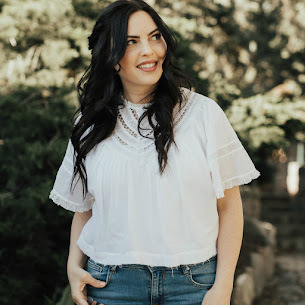 Found your blog on Stylin in St Louis's Spotlight of the Week Linkup. I love that outfit! So simple, but classic and cute!